I prepped my stuff last night so I’d be relaxed this morning and not forget anything. I was happy to have some downtime before going to The Wave lottery one last time and I got to watch some Greys Anatomy. I stayed up late watching last night til 1am and have just 2.5 episodes left to the shocking season finale I keep trying not to hear about. 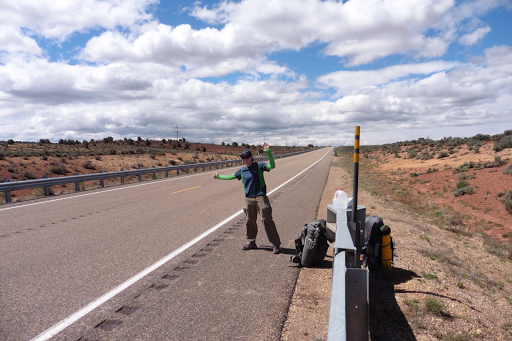 I hope to watch those after this leg when we get back in Kanab. 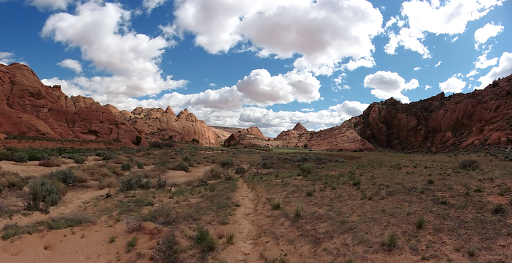 With camping restrictions in the highly destined area of Buckskin Gulch, we needed to hike in 14mi, so we were able to get a later start. Sadly, we didn’t win The Wave lottery and I’m ok with that. Someday I’ll go. 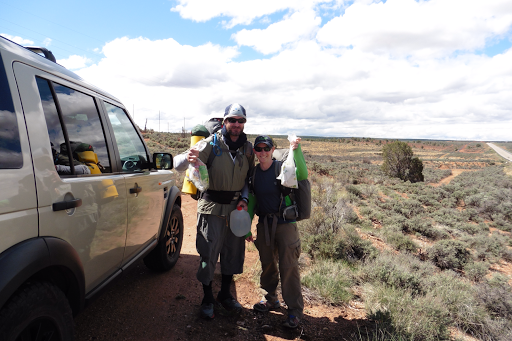 Lori, the awesome chauffeur, dropped us off at the trailhead about 30mi from town with our Subway and full packs of water. Again, THANK YOU LORI!!! And THANK YOU Tumbleweed for hosting us!!! We were unsure if all this rain would provide us with potholes before our next official water source possibly 30hrs away two mornings away. As we hiked out, I multiple times mentioned that it was a smooth exit and that I was trying to figure out what I could have left. Even when we got out of the car, I double checked that I had my maps, GPS, and phone, so I had all the really important stuff…I figured anything minor I would have left would be ok since I was going back to Kanab after this loop….We hiked out and I immediately noticed my shoes felt different and that my feet were sore. I think some of the swelling must have gone down, so my shoes felt big and my feet were sensitive. 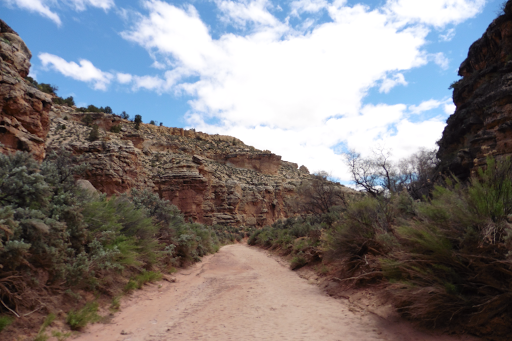 My ankle was back to hurting with the heavy weight of the pack and uneven sandy rocky terrain. I reached back to grab my poles…they weren’t there! I didn’t have hiking poles! That’s what I left! Gavin didn’t have his either. We both put them in the same place. I even glanced at them this morning and told myself to grab them. Again, I can’t believe my idiocy and horrible habit of leaving things behind! We discussed our options with no cell service to call Lori, 30mi from town, and still needing time to make our mileage today. 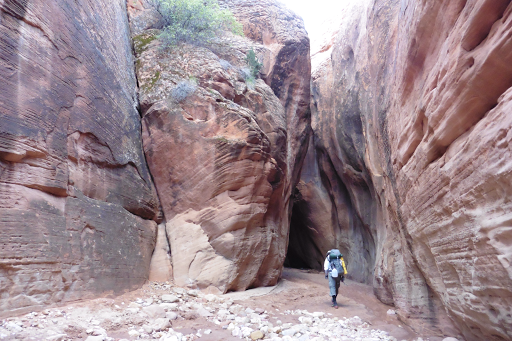 This leg has lots of sand and rocky terrain along with narrows with water of all levels, so poles would be really helpful, and with my ankle, needed. 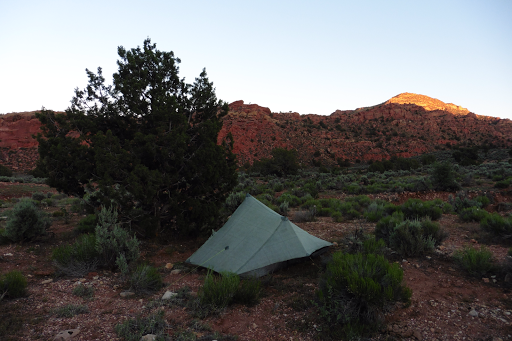 Also, my tent requires two hiking poles to set it up. We considered hiking on and just finding branches (not likely in the desert) and then decided to hitch back down the road to a point where we could get cell service. Ugh! After about 15mins, a nice mother/daughter pair pulled over. 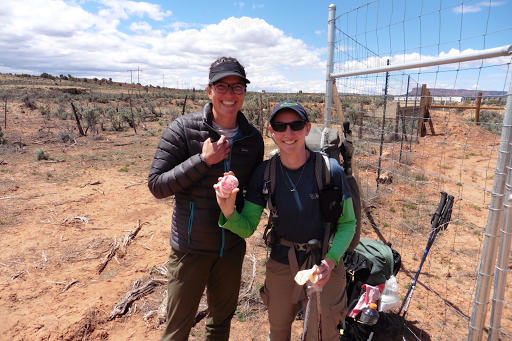 We droge about 10mi back before one of them got service on AT&T and I was able to call Lori, who immediately came all the way back with Trish and the poles. When they arrived to get us from the spot that we called, they said they had seen Katherine getting in a car for a hitch to the trail and the car drove by and we waved. We all ended up getting to the trailhead at the same time. We knew we’d probably overlap today and much of this leg and Katherine had a small gift for me. It was some pink icing cookies! Once long ago, I mentioned that since I did my own resupplies this year, I was bummed not to get the Thin Mints and hometown childhood favorite pink icing cookies. It was very sweet of Katherine to remember that, and the small gift made leaving the poles behind totally worth it to start off with those cookies! My heart and belly was full. Gavin and I hiked on ahead and Katherine hiked solo. 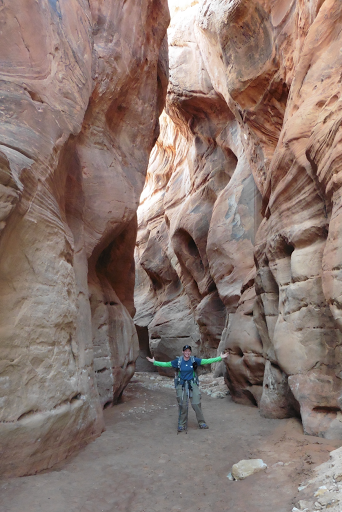 We all have the same general plan for these five days that is mostly an awesome bonus alternate from Nic Barth known as the Buckskin/Paria alternate. 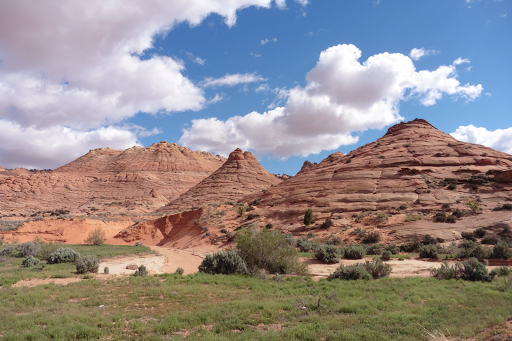 All 14mi of today were on the Hayduke and the next 60mi or so will go through the scenic and fun narrows of Buckskin Gulch and a day in the Paria River with more narrows before taking a route along the Vermillion Cliffs to get back to the highway. It has us missing about 10mi of the Hayduke, so it’s a bonus 50mi to the route, but hopefully well worth it. I’ve already heard from a pair ahead of us that did it and said it was great. Looking forward to it! 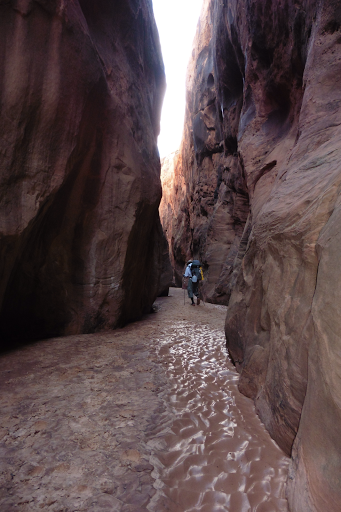 As for today, we hiked mostly on the Hayduke in upper Buckskin Gulch to Wire Pass. It started out like much of the washes we’ve been in and soon opened up to the unique rock formations I associate with this area known as the Coyote Buttes. A couple of miles near Wire Pass gave a little teaser of narrows and just a warm up to what lies ahead later this leg. It is a highly desired and preserved area, so it has a fee for day hiking permits and very limited overnight permits. Basically, we can hike during the day, but to camp, we have to be creative and fit our days and mileages to where camping is legal. That means a 14mi day today, a very short 6mi day (and other bonus hiking near base camp tomorrow, then two big long days of ~25mi/day in slow terrain, then finally a short hike out the final day. 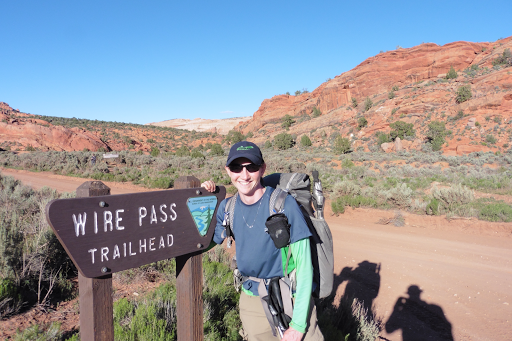 Tonight I’m at Wire Pass for two reasons…to get a picture with the Wire Pass trailhead (ha!) and to camp legally. Gavin went on a bit further to explore an area I wasn’t as interested in tomorrow and we will meet back up sometime tomorrow. I’m pretty tired after staying up late last night watching tv and it’s nice to be in camp and relaxed. Even with our delayed start, I made it to camp by 6:30pm. It’s about 9:30pm now and I’m ready to sleep!